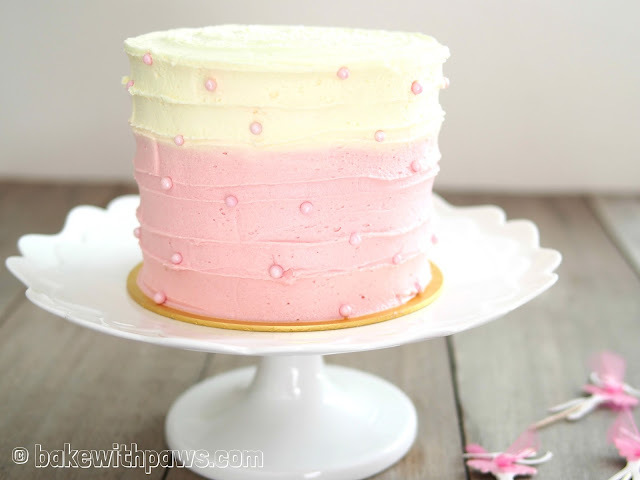 Butter Sponge Cake with Ombre Frosting! May was busy month for me as there are 3 members of our family with a birthday. I was very happy for the opportunity to bake for them. I enjoy the opportunity to practise. Even though the result may not be quite shop perfect, it can be appreciated as home made. This cake was for our sweet little niece. Recipe adapted from Jeannie Tay Blog with some modifications. Utensil : Two 5 inch round pan, greased the sides and line the bottom. 1. Shift flour together with baking powder in a bowl and set aside. 2. In a saucepan, heat butter until just bubbly, switch off fire, then add 2/3 of the flour mixture, stirring until smooth. 3. Add milk and vanilla extract and keep stirring, follow by egg yolks. Lastly, add in the last portion of flour mixer and mix until smooth. Set aside. 4. 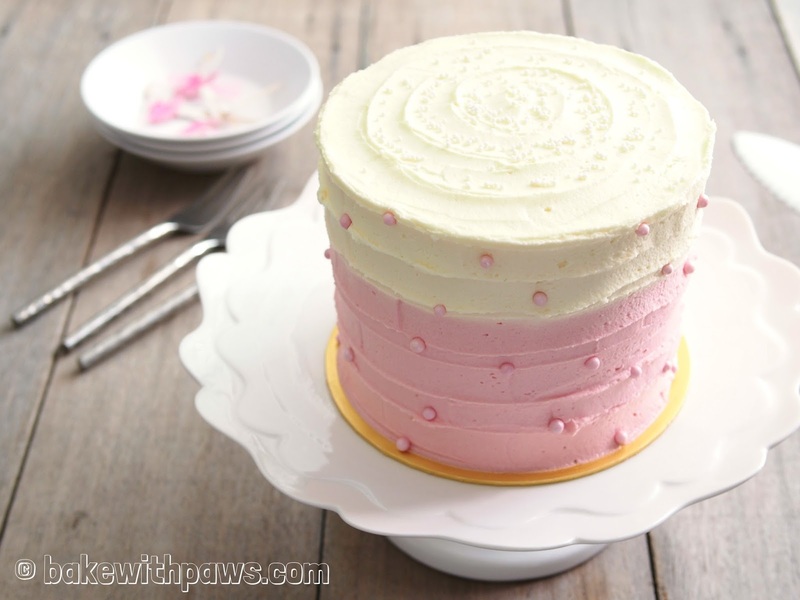 Using an electric mixer, whisk egg white until frothy before adding cream of tartar and continue to beat until foamy. Gradually add in sugar and whisk until firm peaks formed (firm peaks is between soft peaks and stiff peaks). 5. Mix 1/3 of meringue with yolk batter with a hand whisk. Add another 1/3 portion and fold gently with the whisk. Then pour in balance of meringue. Fold gently using a spatula until well incorporated. 6. Pour the batter into the 2 prepared round tin and tap tin lightly to remove air bubbles. 7. Baked in water bath at 155C for 70 minutes. Remove water and return cake into switched off oven to continue baking for another 10 minutes. 9. Unmould as soon as you can. To remove the cake from the pan, run a thin-bladed knife around the inside of the pan and invert the cake on non stick baking paper. Peel off baking paper from the base and re-invert onto a rack to cool. 3. Increase the speed to medium and, with the mixer running, add the cream.